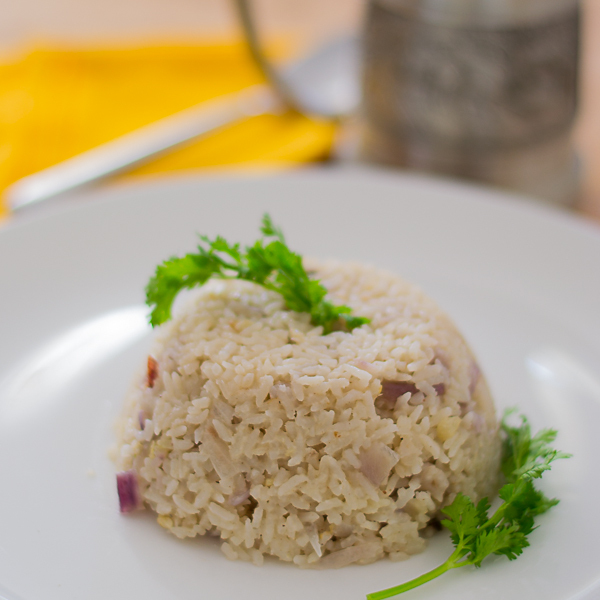 Manju Aunties Thengai Paal Sadam / Coconut Milk Rice Pilaf. 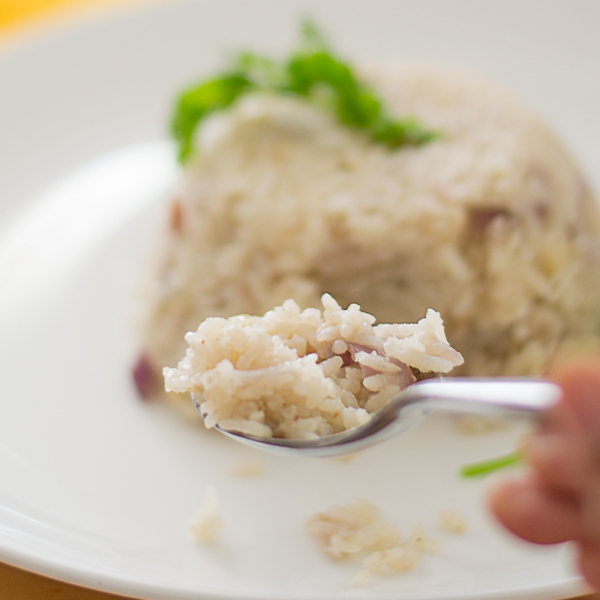 Step by step recipe for flavorful Thengai Paal Sadam Coconut Milk Rice Pulao – gluten free coconut milk rice with garlic and onions. Thengai Paal Saadam – I used to stay in Manju Auntie’s (not a relative) house when I was studying/working. That was roughly a decade plus years ago. I was as any normal teen and I used to get up very late in the morning, miss my breakfast and rush to office. Auntie, will prepare this Thengai Paal Saadam and bring it for me as I missed breakfast. She would get herself dropped on the way from her husband on his way to office. 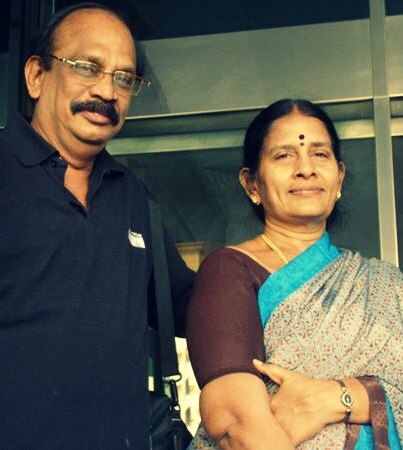 She would come to my office and give the lunch box and say “nalla saapudu enna” – “eat well. ok” and go back home in an auto rickshaw. All this so I will have lunch early. I do not know how many mothers will do something like this for their own children. I entered their house as a paying guest (she never took a single penny till date) and ended up as one of their own daughters. Uncle proudly calls me his eldest. She would do all my laundry and even iron all my clothes. I am eternally grateful to her. She would treat me like a queen when I was sick. I really did not realize a lot of things until my son was born. The perspective of everything changes when u become a parent. It stuck me hard as I don’t remember saying thank you often to her. I always call her whenever I am down and she makes me feel better in an instant. Those couple of years in her house are the best days of my life. Thank you Amma for being there. She is the best person in the whole world. I do not know if she will ever read this but she knows I am there for her. She is an amazing cook and this is one of her signature recipes. This is Manju auntie. The one near her is her equally adorable husband, Babu uncle. Lets start with the recipe. I used seeraga samba rice for this recipe. Basmati rice can be substituted if you cannot source seeraga samba rice. Seeraga samba is a very aromatic rice. The grain of the rice is very tiny and it gets its name for its resemblance to Cumin seeds, also called as Seeragam/Jeera in Tamil. It has a very distinct taste, fluffs up well when cooked and south indian biriyani’s are made with this rice. 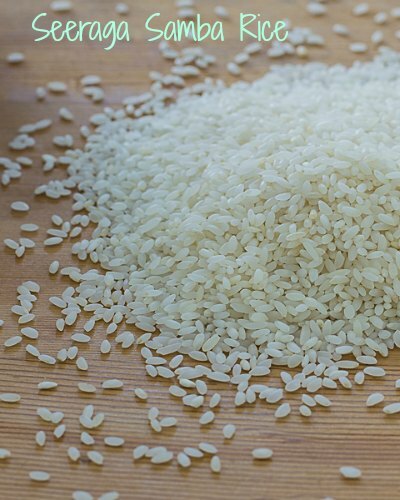 Samba rice is grown for a longer duration than other types of rice. So if u have never made coconut milk pilaf, you should. These things are fun, and fun is good. Lets make coconut milk. You can easily substitute store bought coconut milk if you cannot find fresh ones in your part of the world or you are in a hurry. I used one half coconut for 1 cup (240 ml) of rice. Take out the coconut meat from the coconut and run it in a blender/mixie adding 1 cup of water. Strain. The strained milk is what we call as the first milk or thick milk. Run the strained coconut bits again in the blender with 1 cup of water for a minute. strain. The strained milk is called second milk or thin milk. Once you are ready to start the stove, soak the rice in lots of water. In a heavy deep pan, Heat ghee if using and oil until shimmering. Add in the cardamom,cloves and cinnamon. Add in the sliced onions, chopped garlic and green chillies all at once. Add in the salt. Saute till the onions are slightly brown. Once the onions and garlic start browning, add in the strained soaked rice and saute briefly for a minute. Add in 2 cups of coconut milk (1 cup thick milk and 1 cup thin milk). If you are using basmati rice add 2 cups liquid for every cup of rice. If using seeraga samba rice, use 2 1/4 – 2 1/2 cups liquid for every cup of rice. Let it come to a boil. Reduce the flame to low low low, cover the pan with a lid and let it simmer for 10 minutes. Do not peek when its simmering. After 10 minutes, remove off heat and let it sit on the counter for 20 minutes for the rice to get swollen. After 20 minutes, gently fluff and serve hot. 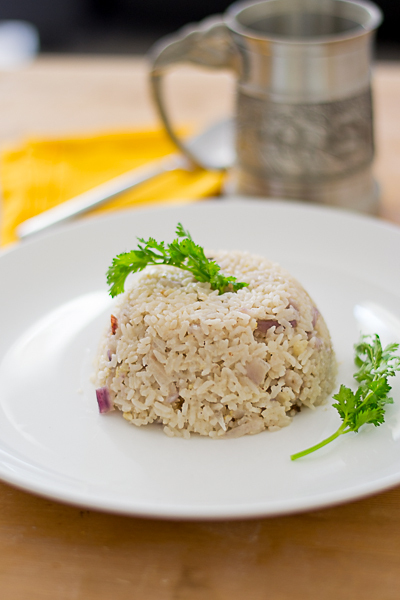 Step by step recipe for flavorful Coconut Milk Rice Pilaf/Pulao- gluten free coconut milk rice with garlic and onions. Make coconut milk: Take out the coconut meat from the coconut and run in a blender/mixie adding 1 cup of water. Strain. The strained milk is what we call as the first milk or thick milk. Run the strained coconut bits again in the blender with 1 cup of water for a minute. strain. 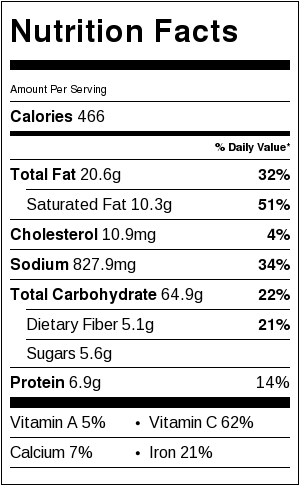 The strained milk is called second milk or thin milk. Set aside. Soak the rice in 3 cups of water. In a heavy deep pan, Heat ghee if using and oil until shimmering. Add in the cardamom,cloves and cinnamon. Add in the sliced onions, chopped garlic and green chillies all at once. Add in the salt. Saute till the onions are slightly brown. Once the onions and garlic start browning, add in the strained soaked rice and saute briefly for a minute. Add in 2 cups of coconut milk (1 cup thick milk and 1 cup thin milk). If you are using basmati rice add 2 cups liquid for every cup of rice. If using seeraga samba rice, use 2¼ cups liquid for every cup of rice. Let it come to a boil. Reduce the flame to low, cover the pan with a lid and let it simmer for 10 minutes. Do not peek when its simmering. After 10 minutes, remove off heat and let it sit on the counter for 20 minutes for the rice to get swollen. After 20 minutes, gently fluff and serve hot. I tried with basmati rice. It came out really well. With single curry dish accompanied by this rice is no less than a feast. On a side note, it is wonderful to see emotional side of this recipe and you are so fortunate to have folks like Manju Aunty’s family. Amazing! Rice came out nice and tasty. It is easy to make. Thanks.. When I cooked this my husband was not interested to eat on seeing d colour. But when he started eating ,his face glowed and had it twice showing super!!!! My children too loved to eat that blushed them telling “adipoli'”.Thank u sugan for d lovely dish. Will this go well with fish fry and prawn curry? Yes Ranjani. It will be yum!! perfect combo!!! I would need an alternative for green chilli.Here at home green chilli is a no no but need a basic kaaram and not bland. So wot would b better to add.How about pepper? This recipe needs green chilli. The colour might change with pepper and the green chilli has a unique flavor too. Very nice recipe.Made it twice that too in an earthen pot and served with Palak paneer. TASTED yummy. Hi. Can you give me suggestions as to what side dish i can make for this rice? Veg and non-veg.. Vegetable Kurma or kongunadu chicken curry, stew…. I tried making this rice and it was yummy ! Easy yet very delicious.!!! Sugs, this sounds like a yummy recipe. I remember this Aunty and yor stay with them:) beautiful post and even more beautiful pictures. Lots to catch up on.. Send me your number, hope alls well!! Thank you so much. I will mail it right away. I was impressed more by your story of acknowledging the aunty. I too lived with a similar aunty and learnt more of how to live life than I ever did including cooking. Thanks for the story. I will try the recipe one day. Thank you Hari! Thanks for stopping by.